ECRI Institute has special expertise in analyzing data from clinical studies. The Institute is a recognized leader in the field of health services research and systematic review of data on healthcare interventions. Systematic reviews examine large bodies of data pertaining to key questions about interventions used in patient care to determine how well various drugs, devices, procedures, or behavioral health therapies work. For bulimia nervosa, analysts developed seven key questions about how well different treatments and combinations of treatments work. They also created a diagram to show the analytic framework they used to develop questions important to consider in patient care. The framework shows the patient population on the left. To the right of the patient population, white boxes list the treatments the analysts identified. To the right of the white boxes, gray boxes show the outcome measures for which analysts sought data from published clinical studies. They focused on outcome measures that matter to patients and are clinical indicators of recovery. 1 How do the safety and effectiveness of different bulimia nervosa treatments compare to each other (pharmacotherapy, cognitive behavioral therapy [CBT], other types of psychotherapy, combinations of these treatments, or other treatments)? 2 How well do medications used to treat bulimia nervosa work, and how do they compare to each other? 3 How well do various modes of CBT work (i.e., individual versus group, standard versus manualized self-help, comparisons of delivery methods such as in-person versus teleconference versus text message, or other comparisons), and how do they compare to each other? 4 How well do other forms of psychotherapy work (behavioral therapy, dialectal behavioral therapy, interpersonal therapy, family-based therapy, supportive expressive therapy, other psychotherapy), and how do they compare to each other? 5 What therapy combinations work best (pharm+CBT, pharm+psychotherapy, CBT+psychotherapy, other combinations, comparisons of delivery methods)? 6 How well do different strategies for maintaining remission work? 7 What adverse events are associated with bulimia nervosa treatments? ECRI Institute’s team of medical librarians and doctoral-level research analysts set out to identify data published in high-quality studies–randomized controlled trials (RCTs)—that would address any part of any key question. The RCT study design has at least one treatment and one control group, uses a method to randomly assign patients to a group, and compares different treatment groups or compares treatment groups to groups receiving a placebo. In the highest-quality RCTs, both patients and the clinicians treating them are kept from knowing which group patients are in. This is called “blinding” or “masking,” which reduces potential biases in reporting outcome measures. The design helps ensure that study results can be attributed to the treatments studied and that factors such as differences in patient characteristics do not confound results. To identify data for analysis, ECRI Institute medical librarians searched 12 databases (such as PubMed, PsychINFO, and EMBASE) for published RCTs on all types of bulimia nervosa treatments. After identifying and screening nearly 550 articles through this process, analysts determined that 47 RCTs had data that could be relevant to 1 or more key questions. Analysts used various statistical methods to analyze data. The methods used depended on the key question, amount of data available, and whether studies included similar patient groups, similar treatments, and similar outcome measures. One technique analysts used is known as “frequentist network meta-analysis.” This technical approach to data analysis enables analysts to use RCT data from different studies to make indirect comparisons that were not made in any single RCT. 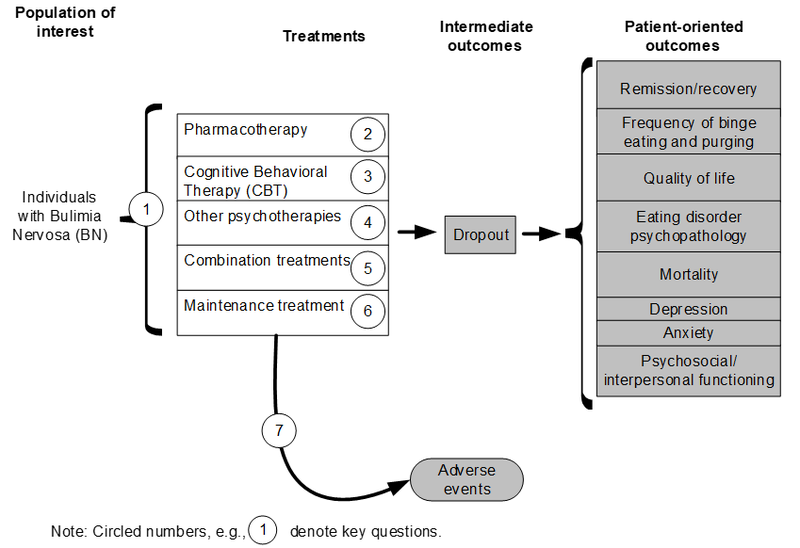 The benefits of this approach include the ability to obtain a more complete understanding of the total evidence and the potential to rank the order of interventions based on effectiveness, even if treatments were not directly compared in any RCT. Tonin et al. (2017) provide a more detailed introduction to concepts and assumptions underlying network meta-analysis). ECRI Institute planned to perform network meta-analysis to address Key Questions 1, 2, and 3: comparing treatment categories, comparing different medications, and comparing forms of CBT. ECRI Institute encountered a recurring problem when attempting the various analyses. The available published studies were often too small to draw firm conclusions about which treatments work best. In addition, results from these small studies could not be combined for a pooled analysis because studies differed in the treatments used, patient characteristics, outcome measures, and the way outcome measures were reported. So, analysts could not compare all the different bulimia nervosa treatments. Furthermore, even when analysts could draw conclusions, they determined that the evidence underlying each conclusion was often weak and of low quality, so the available study results may not reliably measure the treatments’ true effectiveness. Nonetheless, they arrived at the following conclusions for each key question. This question had the most data available to analyze. Pharmacotherapy yields greater improvements in depression than non-CBT psychotherapy (Strength of evidence: Low). CBT is more likely to cause partial remission of bulimia nervosa symptoms than non-CBT psychotherapy (Strength of evidence: Low). CBT and non-CBT psychotherapy result in similar reductions in binge-eating frequency (Strength of evidence: Moderate). Combination treatment yields greater improvements in depression than non-CBT psychotherapy (Strength of evidence: Low). The dropout rate during treatment is higher for self-help treatment than for other types of treatment (i.e., pharmacotherapy, CBT, non-CBT psychotherapy, combination treatment) (Strength of evidence: Low). The dropout rate during treatment is higher for CBT than for non-CBT psychotherapy (Strength of evidence: Moderate). We could not draw conclusions for any other comparisons because of insufficient evidence. Studies of treatment in adolescents were insufficient to permit conclusions about the comparative benefits of different treatment categories. Analysts identified some RCTs on use of fluoxetine (Prozac), imipramine (Tofranil), citalopram (Celexa), and sertraline. However, no evidence-based conclusions were possible about how any of these medications compared regarding these outcomes: remission, partial remission, binge-eating frequency, purge frequency, eating disorder pathology, depression, and dropping out of medication therapy. Only one small study performed head to head comparisons of medications, while the remainder compared drug treatments to placebo. Moreover, poor reporting of outcomes data in several studies hampered the research team’s ability to analyze and synthesize the findings. Only one aspect of this question could be answered with the evidence available: Dropping out of CBT is less likely with patients who follow an Internet-based-guided self-help program than when following a book-based-guided self-help program (Strength of evidence: Low). No other conclusions were possible because of shortcomings in the published studies. These shortcomings included too few patients in the studies, vague outcomes reporting, and differences in study designs that prevented combining them. Only one aspect of this question could be answered with the evidence available: Bulimia nervosa remission rates are higher with family-based therapy than with supportive psychotherapy (Strength of evidence: Moderate). Although analysts also identified studies on dialectical behavioral therapy, interpersonal therapy, and supportive educational group therapy, those studies had shortcomings that prevented drawing conclusions. In most cases, the available studies were designed in a way that may have biased the results to favor one treatment over another, and they vaguely reported outcomes or findings. CBT plus medication works better than supportive psychotherapy at increasing full or partial remission and reducing eating disorder psychopathology (Strength of evidence: Weak). CBT plus 24 weeks of medication was better than CBT plus 16 weeks of medication for reducing the frequency of bingeing and purging (Strength of evidence: Weak). Individual CBT followed by interpersonal therapy works better than group CBT followed by interpersonal therapy for increasing partial remission rates and lowering binge-eating frequency and compensatory behaviors (i.e., behaviors that make up for eating, such as vomiting or laxative misuse) (Strength of evidence: Weak). Analysts could not reach evidence-based conclusions on any other comparisons of combination treatments because the few available studies presented unclear or imprecise results and had a moderate or high risk of biased results. The sixth question examined the comparative effectiveness of different maintenance treatments. Studies were available on use of fluvoxamine (Luvox), CBT plus exposure response prevention for bingeing or purging, and CBT plus relaxation therapy. In most cases, only a single study with a moderate to high risk of bias was available. Therefore, the evidence was insufficient to allow determining whether any bulimia nervosa maintenance treatments worked better than others for several outcome measures, including frequency of bingeing and vomiting, full or partial remission rates, eating disorder psychopathology, depression, and treatment dropout rates. Nine of the 47 RCTs ECRI Institute analyzed reported on adverse events. Most data were available on use of medications rather than nonmedical therapies. Fluoxetine: Four studies reported side effects of this medication. It was associated with tremor, anxiety, sweating, dizziness, nausea, weakness, insomnia, and yawning. Adverse events for other medications may be associated with adverse events that were reported only in single studies. Desipramine alone, desipramine with CBT, and CBT alone: Agras et al. (1992) compared these treatment strategies and reported that 7 of 71 patients stopped medication due to unspecified side effects. Citalopram compared to fluoxetine: Leombruni et al. (2006) reported finding no statistical difference between groups given one of these medications, but the way they reported their data did not enable analysts to determine whether the two medications are equivalent in efficacy and adverse events. Study authors commented that three patients dropped out of the study because of adverse effects but did not report which medication these three people had received. Sertraline: Milano et al. (2004) compared this medication to placebo and reported that patients given sertraline experienced sleepiness (55%), dry mouth (30%), and mild asthenia (8%). Patients in the placebo group reported experiencing headache (20%), asthenia (12%), and insomnia (6%). All reported side effects were commonly associated with use of selective serotonin reuptake inhibitors. CBT versus family-based therapy: Le Grange et al. (2015) reported that hospitalization occurred more among adolescents who received CBT than among adolescents who received family-based therapy; 10 of 13 hospitalizations in the study occurred within the first 8 weeks of treatment.